The 10 Best Senior Discount Offers in Montana! As we get older and wiser, we better understand the value of a dollar—and take a little pleasure in saving one here or there. The good news is that Montana is home to many fine businesses that are happy to have more “experienced” customers and offer a little bit of a reward to keep us coming back. Here are some of our favorite discounts for seniors under the Big Sky. Whitefish Mountain Resort offers a great way for seniors to get out and enjoy Montana’s gorgeous winter months. Whitefish Mountain offers steep discounts on season passes and lift tickets for seniors aged 65-69. The resort’s Super Senior program, however, allows folks who are 70 or older to ski free throughout the season. Dreamy first day inversion. I never realize how much I miss blue skies and sunshine until a chair lift carries me up out of the fog. It felt good to get out of the studio today and take part in the adventure that inspires my art. Montana is a state renowned for its natural splendor—which explains the dozens of state parks under the Big Sky. 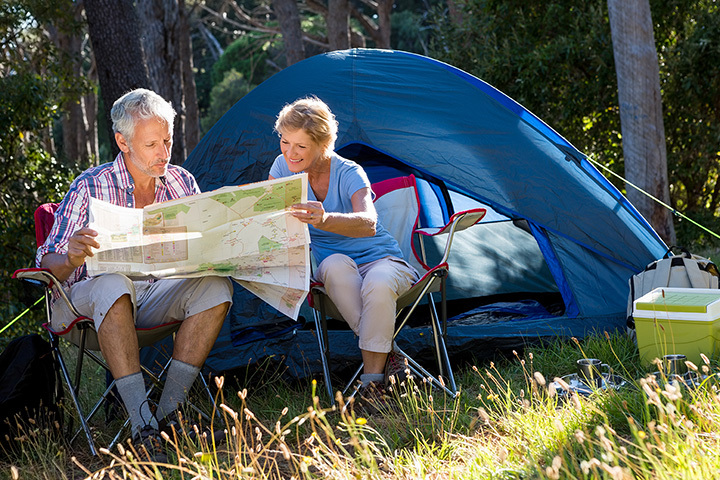 Seniors who are residents of the state can get out and enjoy all the parks in the system with discounted rates on camping and other activities. Seniors who are members of AARP can enjoy discounted rates at the beautiful Marina Cay Resort in Bigfork. Located on Flathead Lake, guests will enjoy proximity to the water, pools, hot tubs, and nearby fishing charters. Accommodation types include hotel-style rooms and suites, as well as condos with kitchens. Seniors aged 55 and over receive discounted daily admission or discounts on the Grandparent Membership at ZooMontana. What’s not to love about this 70-acre wildlife park? It features plants and animals native to Montana or that typically live at or above the 45th parallel. Montana residents aged 65 and over may be eligible for a waiver of tuition from any school in the Montana University System, like University of Montana or Montana State. You need only meet all admission requirements for the school you want to attend and then submit your application for a tuition waiver. In a state as beautiful as Montana, home to some of the most iconic of America’s national parks—Glacier and Yellowstone—it would be impossible not to include the America the Beautiful Lifetime Senior Pass on this list. For the same price as a regular annual pass, folks 62 and over get lifetime admission to all the national parks, monuments, forests, and wildlife refuges in the country. In Montana, this means Glacier and Yellowstone National Parks, the Little Bighorn Battlefield National Monument, as well as numerous national forests, wilderness areas, and recreation areas. Custer’s Last Stand! What an incredible place to visit. Walking into history! Museum of the Rockies, which is affiliated with Montana State University, is a premier natural history museum and federal fossil repository. You can explore the natural history of Montana, enjoy dinosaur fossil exhibits, or even visit the planetarium. If you’re 65 or older, you’ll also enjoy discounted admission. If you’re making a trip to the state’s largest city—maybe for a little shopping or a holiday parade—stay at the DoubleTree. Not only will you get suite style accommodations (and that warm cookie on check in! ), you’ll also enjoy discount rates if you’re 65 or older. Hop the Empire Builder, Amtrak’s line across northern Montana, and explore the state by rail. With a dozen stops in the state between Libby, at the Idaho border, and Wolf Point on the Missouri River near North Dakota—including Glacier National Park—you’ll have plenty of opportunities to see what the state has to offer. Seniors 62 and older receive a 15 percent discount off the lowest available fare. The World Museum of Mining features exhibits and tours that demonstrate what made Butte, Montana, “the richest hill on Earth.” Explore Montana’s rich mineral and economic history, and the cast of characters that helped exploit it, with a visit. Seniors 65 and older receive discounted admission.